Shining Sea Bikeway: Falmouth and Woods Hole, Mass. A bike mosaic on the northern half of the Shining Sea Bikeway. So, what I was saying in my last post about how fall’s a really good time to go hiking, because the heat’s tapering off and the tourist crush is winding down? A couple of years ago, the family and I went up to Cape Cod (our first time there, believe it or not) in the fall for four days of biking and sightseeing. It was early on in the fall – late September, early October or thereabouts – so the weather was mild without being too warm. And we crammed in quite a bit – puttering around Wellfleet and Truro, a whale-watching trip out of Provincetown, and a good seafood dinner in Woods Hole for our last night there. And for the biking part of the trip, we did the Shining Sea Bikeway. The 10.7-mile bikeway, which is managed by Falmouth’s Bikeways Committee, gets its name from the line “from sea to shining sea” in “America the Beautiful;” the composer, Katherine Lee Bates, lived in Falmouth for much of her life. There is a street named for her in the town today. The bikeway is a rail trail – a railroad line that has had the tracks removed, and the rail bed converted into a recreational trail. Cape Cod is home to a few other rail trails, like the Cape Cod Rail Trail from Wellfleet to Orleans. The Shining Sea Bikeway was built on the site of the New York, New Haven and Hartford Railroad, which in turn was built on or along some old Wampanoag trails. The railroad went defunct in the 1960s, but in the 1970s, Falmouth decided to start turning the land into a recreational trail, as part of the town’s contribution to the bicentennial celebrations. Getting there: The family (in a car with a bike rack that can carry four grown-up bikes) met up with me and my bike in New Jersey after I had gotten home from work. We took the GWB and the Cross-Bronx Expressway (which at that hour of the day was its usual sluggish mess) to hook up with the New England Thruway. Arrived at our hotel in Falmouth that night, and set out for the trail the next morning. There are a couple of designated parking areas for the trail in Falmouth. We left the car at the parking area just off Locust Road, a short drive from the center of town, did some stretching and saddled up. Terrain-wise, the bikeway is a nice easy ride. This being Cape Cod, the trail is very flat, with no inclines to speak of. The guides also indicate that the trail is also fairly popular with roller bladers and pedestrians. The trail alternates between paved road and some planked causeways through some of the woods. The northern section of the trail goes along the coastline of Buzzard’s Bay, past a few swimming beaches and some wide expanses of marsh grass. There are also some cranberry bogs thereabouts, according to some of the guides. It goes without saying: Bring plenty of water with you, and drink up often, even if you don’t think you’re sweating. A few people in our party started getting a mild case of heat cramps later on in the day. On the southern half of the trail, the trail goes through the outer edges of the town and through some woods, before coming out to ride near the dunes overlooking the Vineyard Sound. 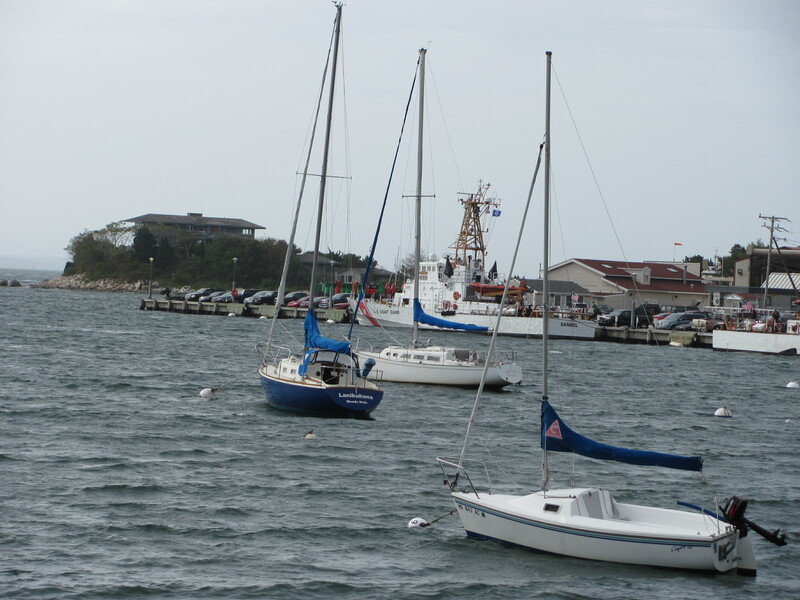 From there, it’s a short ride into Woods Hole. View of Woods Hole from the trail. We rode into town and caught the ferry over to Martha’s Vineyard. Had lunch at the Mansion House (I had the fish and chips). Then it was out for some more biking around the island, including up to the lighthouse on Telegraph Hill. Had time to make a stop at Mad Martha’s for some absolutely knockout black raspberry ice cream before getting back on the ferry and pedaling back up. We attempted another ride down to Woods Hole the next day. But there were some strong breezes coming in off of the ocean and over the dunes, and carrying a lot of sand with them. So rather than get sandblasted, we turned around and rode in the other direction, off toward the northern end of the trail. 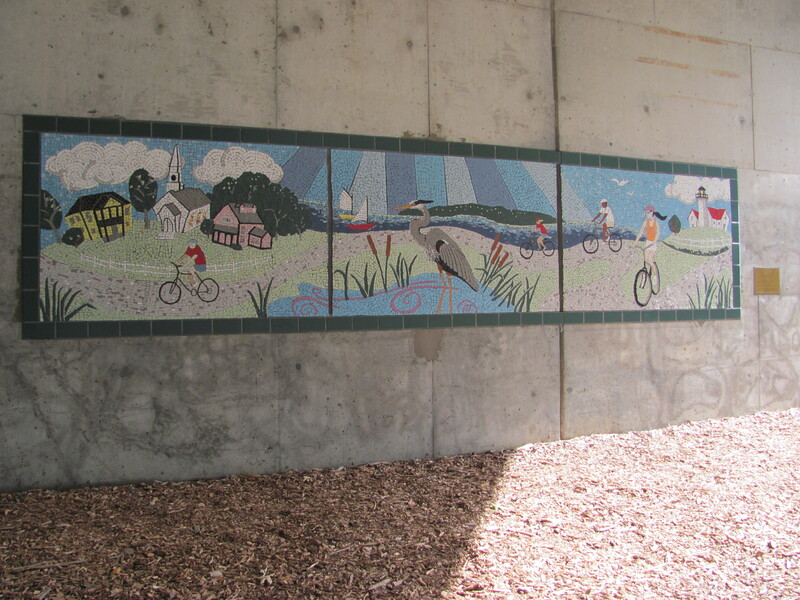 It’s up near that end of the trail that you’ll find a nice bike-themed mosaic on an overpass going over the trail. We didn’t make it quite up to the northern terminus; got at least a few miles out before we decided to turn around and ride back, since we had other plans for the day – including a junket up to Wellfleet. We’ll have to save a complete top-to-bottom ride on the trail for another trip. But what we were able to do – was it amazing? Oh, good grief, yes. Town of Falmouth Bikeways Committee: The page has a nice, very detailed description of the trail land, complete with geological and cultural history.